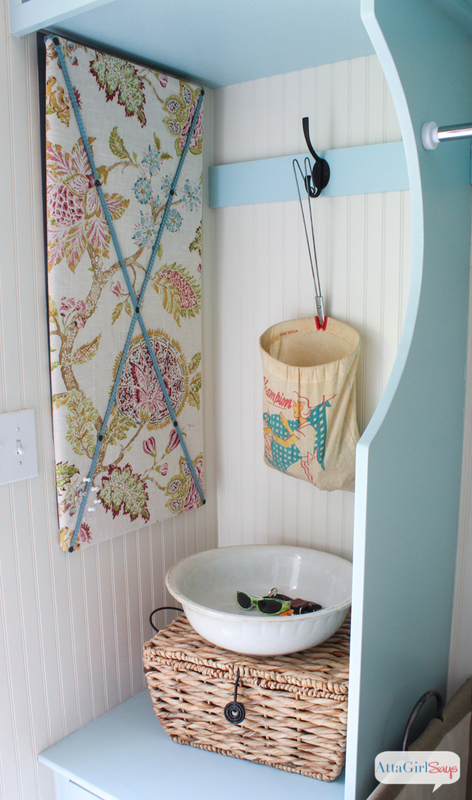 Take the drudgery out of washing clothes with these bright and colorful laundry room ideas that also work for the mudroom. You’ll find lots of great storage solutions, too! I have been waiting weeks for this moment. The building and painting are done. The sawdust has been swept away, and the space is styled. 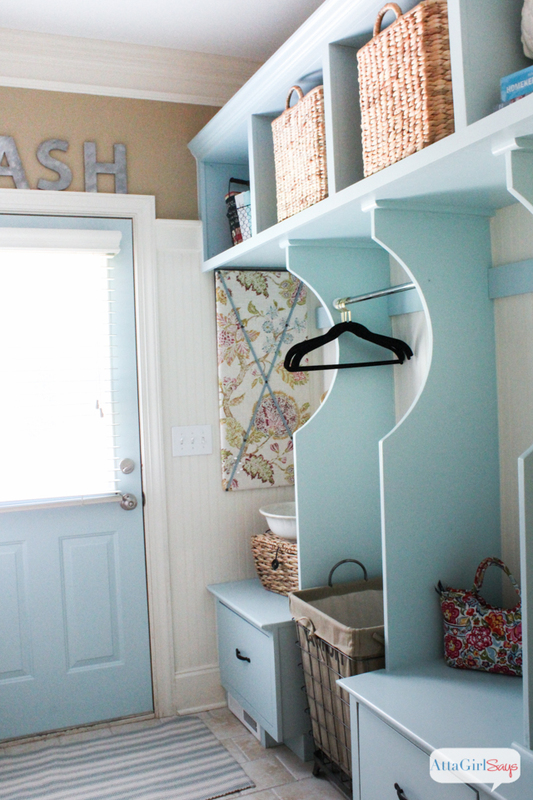 I finally get to share with you our laundry room and mudroom renovation and makeover. Since we moved into our house, a little more than two years ago, I’ve been struggling to make our combo laundry room/mudroom functional and pretty. This room is right off the garage entry to our house. So, when we come in the door, we head here first to drop off our stuff. The dog eats here. We do multiple loads of laundry in this room. every day and we store lots of everyday essentials in this room. It might be the busiest room in our house. While the room had good bones (beadboard paneling, picture rail, crown molding and a built-in hamper), it wasn’t working for us. This before photo isn’t reflective of how the laundry room looked most days. The baker’s rack became a dumping ground. And that built-in hamper was useless as a dirty clothes hamper and useless as storage because the bench would always be so piled with stuff that we couldn’t open it. To make matters worse, I didn’t really have a place to hang clean clothes in the laundry room. I had a wire shelf above the washer and dryer, but it was hung too high. And once I put the front-load washer and dryer on a pedestal, the hanging rack became even more difficult to access. So, I did what any frustrated domestic diva would do. I hopped on Pinterest and started dreaming, devising and drawing, collecting inspiration for mudroom and laundry room ideas. You can check out some of my inspiration here and here. This was a bigger DIY project than we had the tools, time or talent to handle ourselves. So, we pinched our pennies and hired a local contractor, Chad Williams of Chad Williams Design Build. Chad came highly recommended by our neighbors, and we second that stellar recommendation. Chad made sense of my inspiration photos and design sketches and designed a laundry room that is tailor made for our family and our needs. 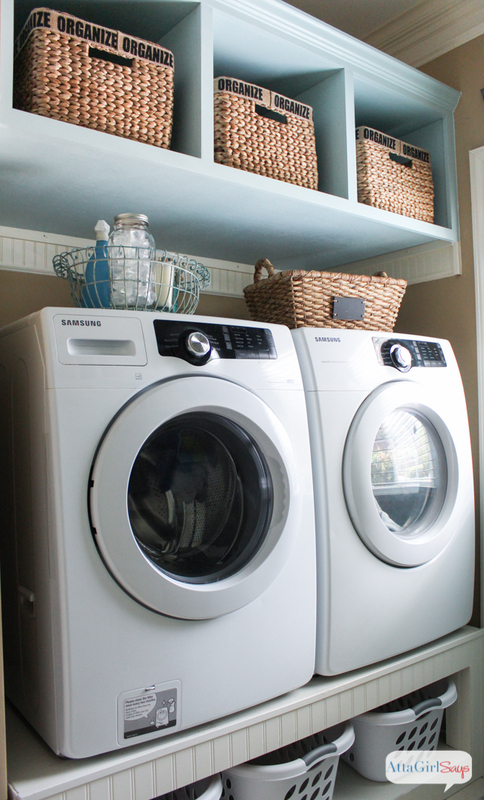 He was able to take my laundry room ideas and make them a reality. I also knew Chad’s company was the best choice for the job once we started talking about upcycling and repurposing and reclaiming building materials. And it turns out I went to high school with his cousins. In the south, knowing that someone comes from “good people’ counts for a lot. In designing our laundry room, I knew I wanted lots of storage. Cubbies with baskets to hold seasonal items like hats and gloves or pool towels, sunscreen and insect repellent. (We could have used more bug spray a few weeks ago.) Plus hooks for hanging shopping bags and purses and backpacks. And a niche for a hamper and a place to hang clean clothes. And deep drawers for cleaning supplies, extra laundry detergent, household tools, batteries and other sundries. My washer and dryer are still on the DIY laundry pedestal my dad built for me, and I’m able to slide three laundry baskets for clean clothes underneath. I wanted more storage above the washer-and-dryer, and I got it, in the form of extra deep cubbies. Tucked inside those baskets are things like seasonal craft supplies and light bulbs. (And can you believe one of them is still empty?) My laundry room is so organized that I have empty storage bins! Unreal. And probably very temporary. 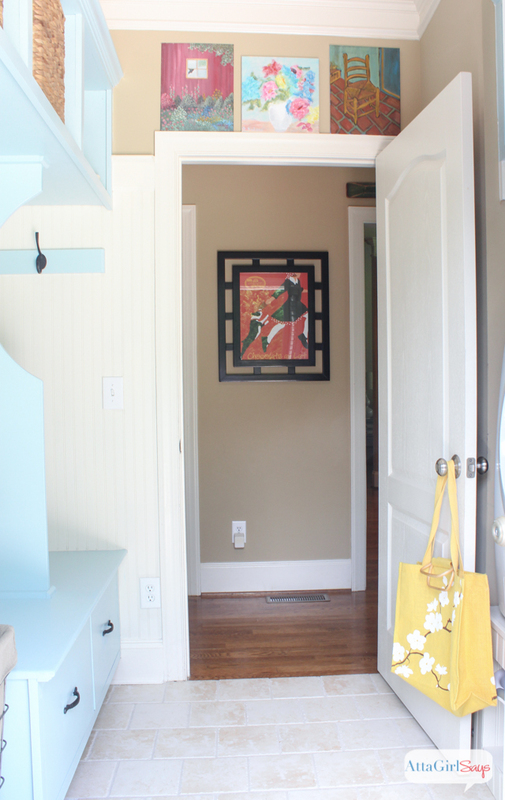 As I was collecting inspiration photos of mudrooms and laundry rooms, I knew that I wanted to paint the new built-ins a contrasting color to brighten up the room and personalize it. I left the walls Dorado Tan by MAB, and the beadboard Sherwin-Williams Lyric White, which matches the rest of the trim in the house. 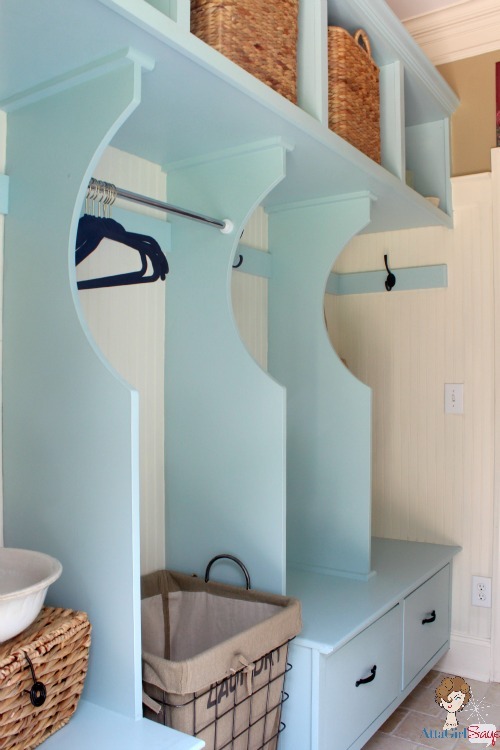 For the cabinets, I chose Watery by Sherwin-Williams, a pretty cottage blue. I decided to paint the door leading outside Watery, too, and I’m so glad I did. This was the first time I’ve ever picked a paint color without painting a test patch first. Sometimes you just know. I love the unexpected pop of color so much I may have to paint other doors in the house. Here’s a view looking into the laundry room from that outside door. Though I lost my picture rail in the laundry room renovation, I still was able to find a way to creatively display some of my paintings and my grandmother’s. While my first order of business after moving back in the laundry room was to wash clothes, decorating was a close second on my to-do list. I covered a cork panel with a pretty floral fabric remnant to create an easy-to-remove bulletin board to hide the eyesore electrical panel. (The fabric-covered bulletin board I made for the old laundry room doesn’t fit any more.) By a stroke of incredible luck, the cork panel was exactly the right size to disguise the electrical panel. So grateful for that because I agonized over how I was going to hide that ugly space in my otherwise beautiful laundry and mudroom. Because we still need a place to drop our keys, sunglasses and mail and empty our pockets when we come in the door, I designated a vintage ironstone bowl from my mom for the job. A wire basket atop the washer corrals detergent, fabric softener, stain remover and other laundry essentials. A hyacinth basket with a chalkboard label holds ironing supplies. And there you have it, my new happy place. I do plan to add a new Dash & Albert runner in the laundry room, but I’m still deciding on the pattern. 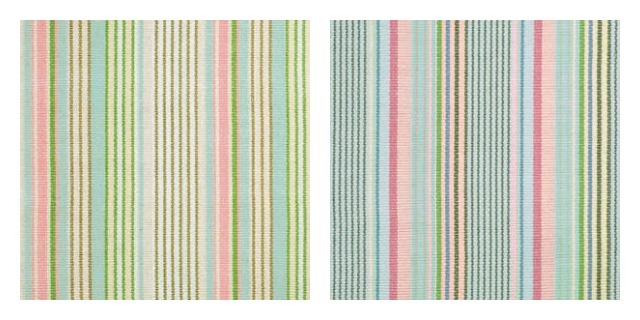 It’s down to these two: Ana Aqua Ticking (left) and Neapolitan (right). Which do you like best for my laundry room? I’d also like to switch out the fluorescent lighting in the laundry room for something with more style. I’m thinking about a pair of porcelain enamel lights, but I can’t decide which of these I like best. Contractor: Chad Williams Design Build of Greensboro, N.C. 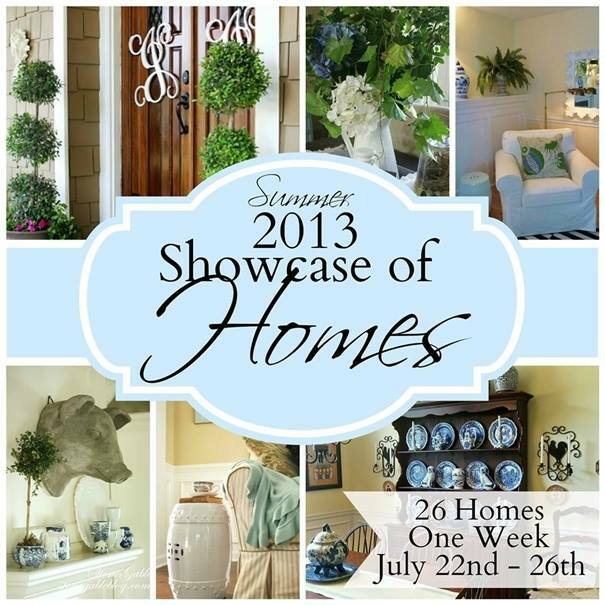 If you enjoyed this tour of my renovated laundry room, I hope you’ll stop by again on Monday when I’ll be sharing my home tour as part of the Summer 2013 Showcase of Homes. I’ll be joining 25 other bloggers in this weeklong series. 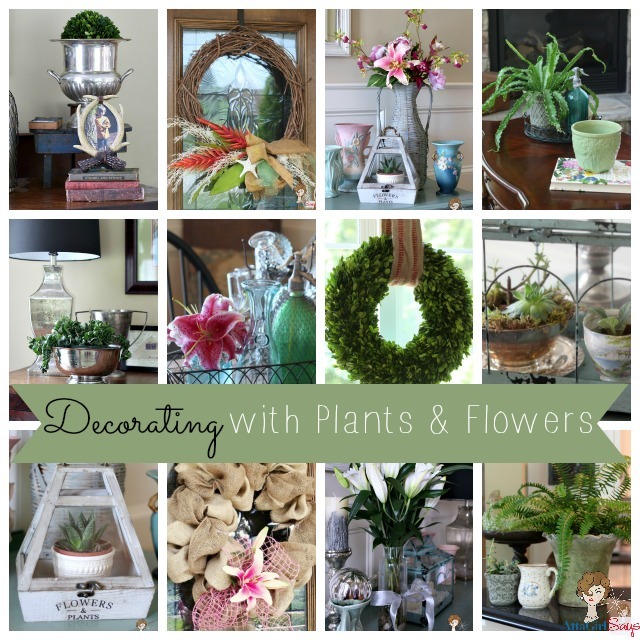 Every day, some of my favorite home decor bloggers will be taking us on a tour of their homes on their blogs. You can find the full schedule here. Looks fantastic, Amy! 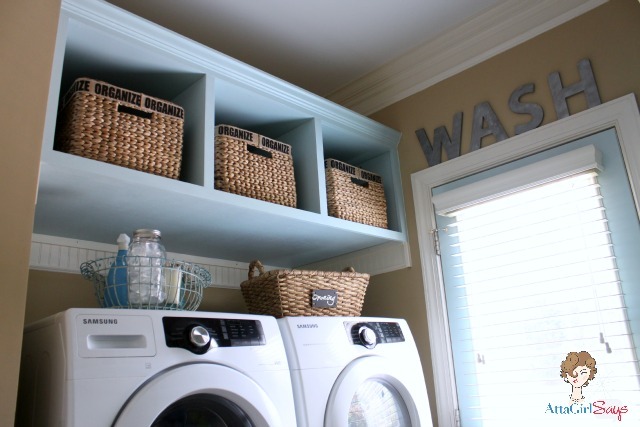 I’ll be pinning your laundry room to my laundry room Pinterest board, where I continue to gather ideas and inspiration. 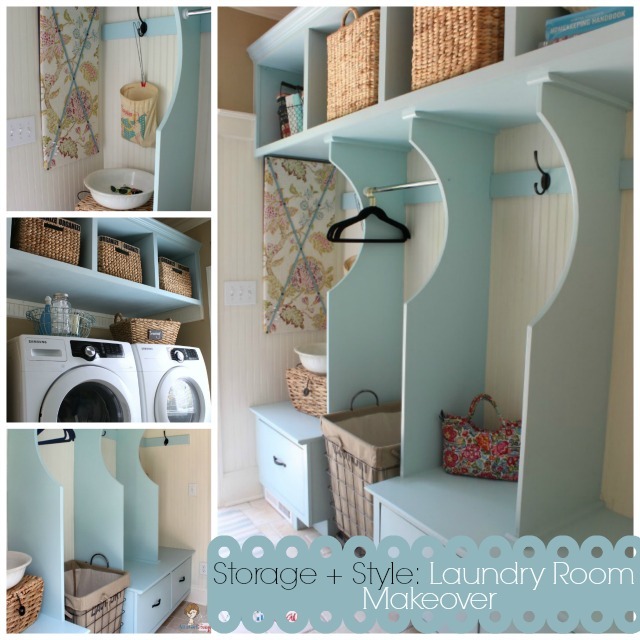 Amy – your laundry room is too, too fabulous! I would want to just sit in one of those cubbies and enjoy the space all day. I love all the colors that you’ve chosen – so reflective of you. Either one of those rugs would look great in there, but I tend to lean toward the one on the right. I looked at the description of the rugs on the D&A website. I should be able to cut/hem them for you with no problem at all. I love the blue cubbies! And the great baskets! 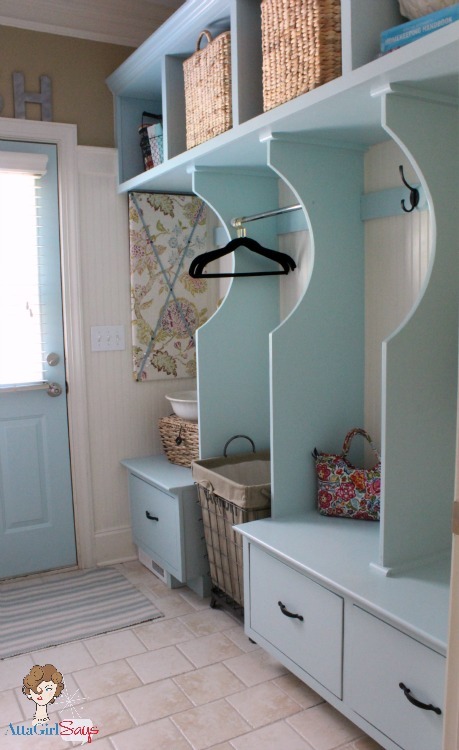 This just might inspire me to do *something* with my laundry room. It looks amazing Amy! I love every bit of it!! Amy I LOVE it!!! Everything about it… the colors, the baskets, perfect!!! Absolutely stunning! You did a great job!! Beautiful Amy!! !…you left no detail undone!..I have that very same clothespin holder!..Just love the color and all of the cubbies!! !…you must be so very happy with your new space as it is wonderful!!! Wow. You did an amazing job, girl! I love the colors, especially using it on the backdoor. I am totally drooling over the built-ins and baskets. Your styling is great and your photos awesome! I’m so envious! What a cheery laundry room! Wish I had room for built ins like yours. 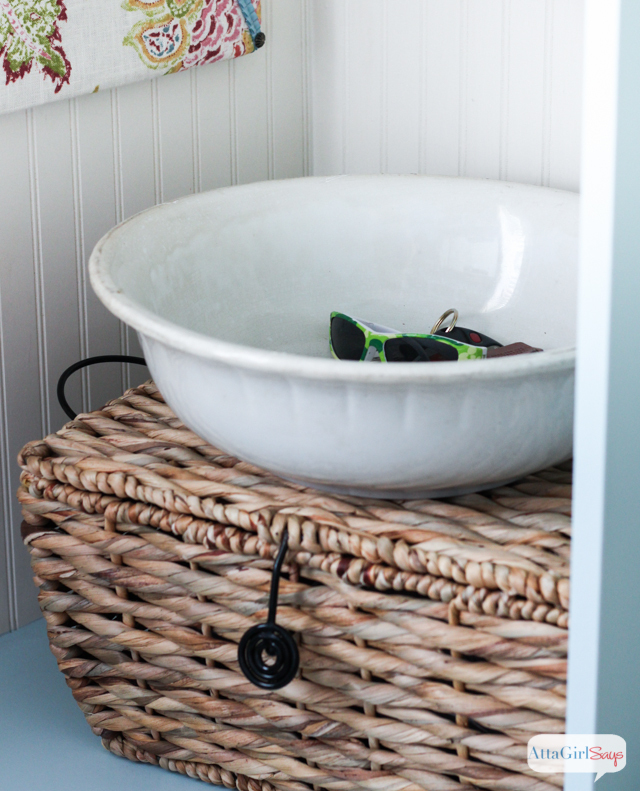 Loving all the baskets….and Dorado Tan is my favorite “khaki” color. It just works with everything! This is the first time I have come across your blog and I can’t wait to read more! 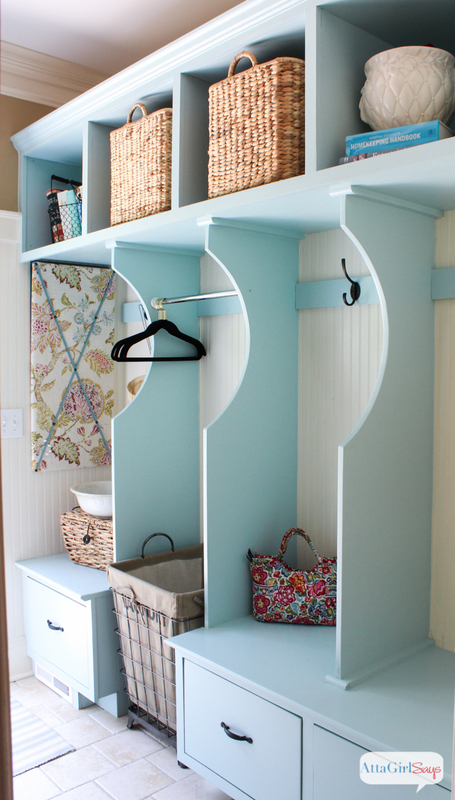 Your mudroom/laundry room is beautiful, I so wish I had that much room in my laundry room! Just in case your taking votes I love the Neapolitan! I love how you still have your washer and dryer up on the pedestals. 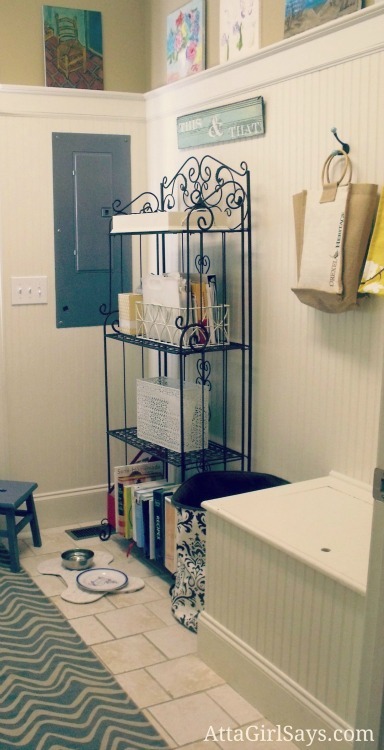 I’m getting ready to redo my laundry room…thank you so much for the ideas and motivation! Pinning! Your beautiful laundry room has inspired me greatly. We have not lived in our new home a year yet, but our laundry room is painted apricot. I haven’t changed it yet…so much to do and think about. Thank you so much for sharing such a wonderful post. Such a beautiful room! I wouldn’t mind doing laundry at all if my laundry room looked like that. I love the blue paint you used. Thanks so much for sharing! Enjoy your day! Wow! This is beautiful… What a difference! I wouldn’t be able to pull myself out of there! Uh…no. LOVE the room but don’t love doing laundry..at all! lol! Gorgeous room! The next house I buy will definitely have a mud room/laundry room! I love the colors you chose…so calming. I’m pinning this for my dream home. Thanks for sharing! wow, you win! 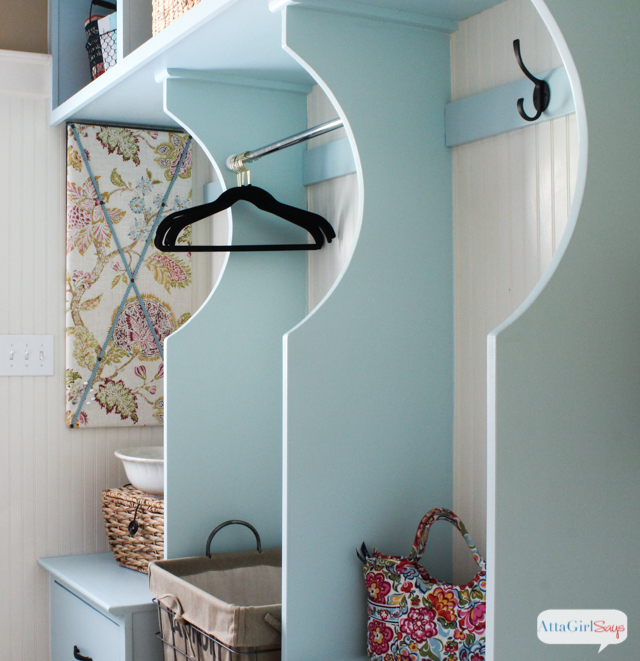 Cutest laundry room ever! Love the pale blue and I like the neopolitan color, I don’t think it would show dirt as easily. I bet you love to do laundry now! Looks fantastic Amy! I love the shade of blue against the other colors! Very well thought out for functional , everyday use! Beautiful! And I like the Neopolitan. I love this room !!!! Thanks so much! Nearly a year later, I still love my laundry room — just not the laundry that keeps piling up. Oh, thank you very much. I definitely love my laundry room, and I’m so pleased with how it turned out. Now, if those piles of laundry would just go away, I’d be REALLY happy!